LORRI camera images of Pluto from July 13 (left) and July 14 (right) – the enlarged area shows a second mountain range on the border of Tombaugh Regio. (NASA/JHUAPL/SwRI. Edit by Jason Major). 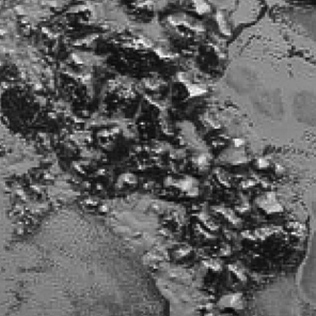 A new image from New Horizons has emerged, showing a new, smaller mountain range on the southwestern border of Pluto’s “heart” region. The image was captured during the July 14 flyby, during which time the spacecraft passed less than 8,000 miles from the planet’s surface. This new cluster of mountains are much less lofty than the Norgay Montes, seen in the first flyby image, which rise nearly 11,000 feet (3,500 meters) from the surrounding terrain. Rather than Rocky Mountains these are more like the Appalachians, 0.5 to 1 mile (1–1.5 km) in height. But they’re not far away from the previous range, only about 68 miles to the northeast. These mountains rise about 1-1.5 km from the surrounding icy plains. The mountains lie at the sharp border between the light-colored terrain of western Tombaugh Regio (the heart) and much darker terrain to the west. I’ve spent a lot of time just staring at those photos thinking about what they mean and what it took to get them. The word “awesome” is so overused these days that it doesn’t really even begin to describe the feeling.